Since I’v been drawing so many astronauts and astroscapes, I thought I’d throw back the curtain a little and explain my process. I have skipped the penciling stage in this post, but, faithful readers, if you would like to see that stage, I’d be happy to oblige. I had originally applied a wash directly to this piece, but I took it out when I decided to apply a wash digitally. Here’s the astronaut sans wash. This is the wash that I did on a separate piece of bristol. Once it dried, I used a brush to splatter white ink over it to resemble stars. I touched up some of the shadows on the astronaut. I also tool parts of another wash to create the “depressurizing bolt” emitted from the astronaut’s cracked helmet. In the future, I’d like to ad another tone to the astronaut’s body, and maybe add some planets. Here’s another piece I did at school. 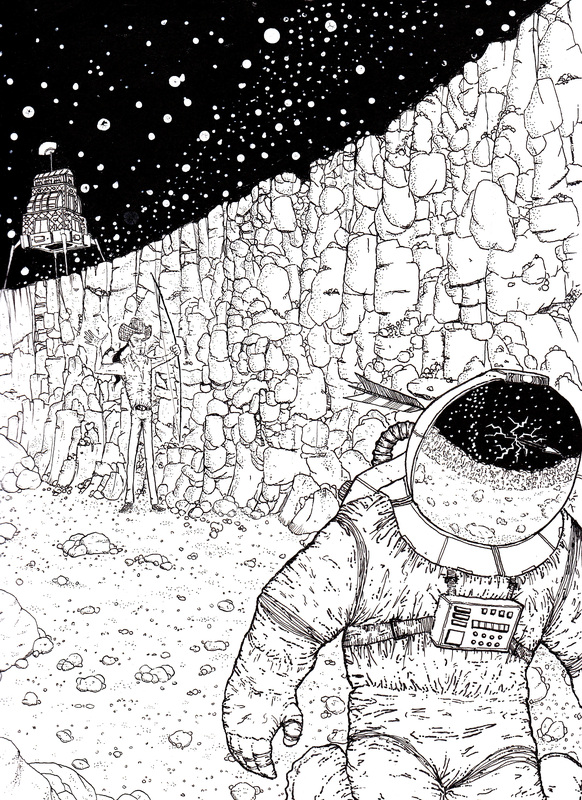 The assignment was to draw someone in an incongruous setting, so I drew Ted Nugent in space. I unintentionally made him blend into the rock wall, as if the Nuge lies in wait.